From hidden caves and arctic fortresses to urban towers and sanctums sanctorum, comic book heroes have distinctive places they call home in their costumed identities. Likewise, villains operate from hidden lairs and brooding castles, and finding and breaching a villain’s headquarters can be an important part of an adventure. 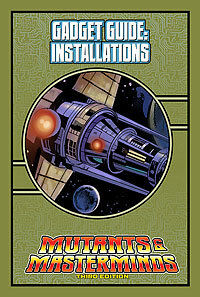 This Gadget Guide looks at installations of all kinds, including heroic headquarters, villainous lairs, and the many places where heroes and villains might clash in a Mutants & Masterminds series. Ronin Round Table: The Name Game Ronin Round Table: Downloads Ahoy!